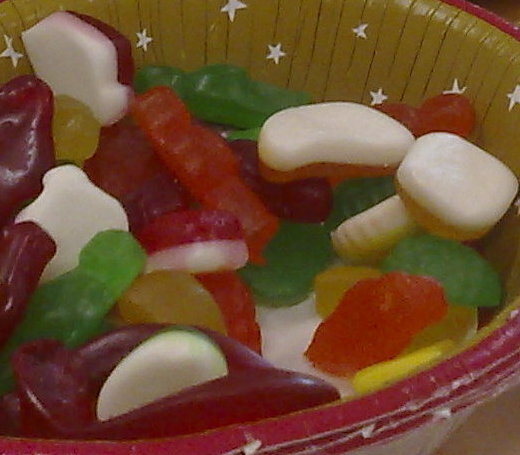 For the last two or three years in the run up to Christmas one of my colleagues has been in the habit of bringing in some “lollies” as a gift to the workplace. Snakes. Bananas. Teeth. Bullets. You know the stuff I mean? The stuff we all grew up with and love. Even butter-scotch which is a particular favourite of mine. He places them on the partition above his workplace in some “party bowls”. It’s a lovely thought on his part, and we all think it’s terrific that he does it. But oh my, it’s such a temptation for those of us with a sweet tooth! There must have been eight or nine occasions today when I needed to go to his desk to ask about something. “How are you going? Is everything okay? Shall I check back in half an hour?”, I found myself asking, while sneakily grabbing another sweet (or two). Just yesterday, another colleague who I haven’t seen for a while commented on how much weight I’ve lost this year. “I can’t believe it’s as simple as regular exercise and eating properly. It’s crazy! I always thought it was glandular!”, I told him, adding that I’m sure there’s room on the market for another weight-loss book based on my experience this year. But with the sweets on my colleague’s desk, I fear I’m on the verge of a return to being overweight. Nooooo! Tomorrow, I’m going to have a lollie-free day, I swear. And next year, he’s moving to an earlier shift, so hopefully that might help as well. Those lollies are deadly to me. I simply can’t resist ploughing through them.